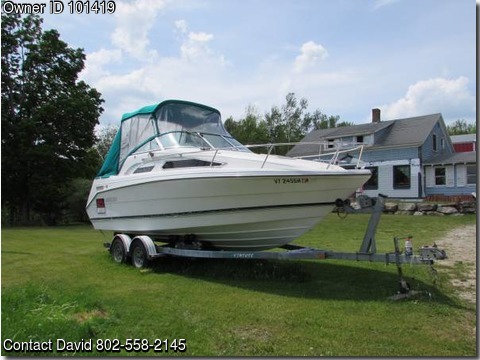 Boat is located in Rutland,Vermont.Please contact the owner @ 802-558-2145...1991 Rinker 235 Fiesta Vee 5.0 LT 225 HP Volvo Penta DualProp 25 watt VHF Hummingbird fish finder. 800 Watt inverter. Battery charger Port-potti/Head Shore power/with 30ft cord Galley/sink/electric cook top/refridgerator Grille 20gallon fresh water Aft cabin/ sleeps 4-6 Vee berth / table Camper top with screens/mooring cover. New interior and canvas/ensign glass Two sets of props New carb/fuel pump Serviced with synthitic oils/ new filters AmFm/Cd/Aux port 4 Speaker system Two Anchors and new rope 4 Bumpers/lines 6 Life jackets 1998 Venture roller trailer/surge brakes with spare tire 10500 or OBO Summer is here and the lake is getting warmer Pulls a tube, skis, or a wake board.